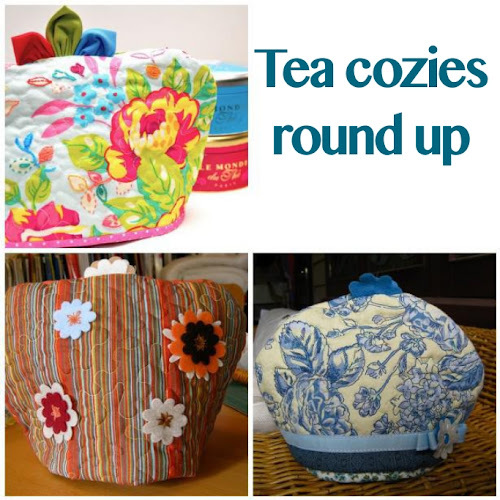 Tea cozies are quick to make and they are great gifts for any occasion. Here you have three different tutorials to make 3 quilted tea cozies which have been embellished in quite different ways using embroidery, felt shapes, ribbon and a matching border for the floral quilted cozy. Small projects like these ones will allow you to improve your skills such as free motion quilting or embroidery without overwhelming you. Embroidered fabric tea cozy tutorial. The fabric in this tea cozy has been embroidered though it is not noticeable in the small picture. Also the petals on the top are a nice touch to the cozy. Felt embellished tea cozy tutorial. Use store bought die cuts to make this tea cozy. Attach the die cuts using some simple embroidery stitches or buttons. Add a matching border and some ribbon to embellish this very simple cozy. 1 or 2 fat quarters, depending on whether your cozy front and back and lining are the same fabric or not. Measure your teapot around the widest part. Now measure it around its height from side to side. Divide both measurements by 2 and add 1.5 inches to each. My teapot is 24 around by 17 high. This translates into a half circle which is 14 wide and 11.5 high. Make a pattern with the measurements. My pattern was half a circle. Then I placed both fabrics right side together, folded them and placed the flat long edge of the pattern on the fabrics folded side. Then I cut around it with my rotary cutter. When finished cutting you need to have 2 pieces from the fabric, 2 pieces from the lining, 2 pieces from batting and 2 from calico, if using calico. Make a quilt sandwich with the outside fabric, the batting and the calico (if using, otherwise just use the fabric and the batting). I only used fabric and batting and the sandwich didn’t seem to move as easily on the machine. I’ll try with some calico batting next time. Quilt as you wish. I used stipple quilting. If you wish you can make a handle for the top of the cozy. I used 2 felt flowers cut in half. Place the quilted pieces right side together, place the handle in the middle facing the flat part of the pieces and pin in place. Stitch around with half an inch seam around the curved edges of the cozy. Now attach any felt shapes you’re going to use to the quilted side just before the lining is added. Place the lining with right sides together, pin in place and stitch around the curved part with half an inch seam allowance. Leave a 4 inch opening at the top so that the cozy can be turned inside out. Pin the lining to the cozy, like in the photo below, right sides together. Stitch all around the flat part leaving half an inch seam allowance. Turn cozy inside out through the opening in the lining. and press the lower edge flat.